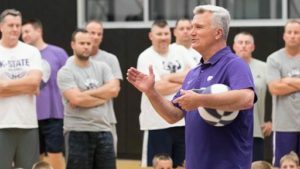 MANHATTAN, Kan. – Kansas State men’s basketball head coach Bruce Weber has announced his 2018 summer camp schedule for area youths on the university campus. The 2013 Big 12 Coach of the Year, along with his coaching staff, will direct these summer camps, which begin with the Father/Son Camp (grades K-6th) from Friday–Saturday, June 8-9. The camp season also includes the Powercat Day Camp (grades 4-9), which runs from Monday–Thursday, June 11-14, and the Wildcat Day Camp (kindergarten to grade 6) from Monday–Thursday, June 18-21. The two-day Team Camp will run from Saturday–Sunday, June 23-24. All camps will be played at Bramlage Coliseum, the Ice Family Basketball Center and the newly-renovated Chester Peters Recreation Center on the K-State campus. These camps are open to any and all entrants, limited only by number, age and grade level. The camper’s grade level is the one heading into the 2018-19 school year. The Father/Son Camp offers fathers and sons a great opportunity to spend a special weekend on Friday–Saturday, June 8-9. Emphasis will be on teaching fundamentals to the fathers, who in turn teach them to their son. Space is limited. The cost is $250 per pair and $100 for each additional son. The Powercat Day Camp, which runs Monday–Thursday, June 11-14 from 9 am to 4 pm, is available to youth in fourth through ninth grade at a cost of $230 per camper. The camp’s primary emphasis will be on the fundamentals of dribbling, passing, shooting, rebounding and defense, while preparing campers for middle school and high school basketball. The Wildcat Day Camp, which runs Monday–Thursday, June 18-21 from 1-4:30 pm, is available to youth in kindergarten to the sixth grade at a cost of $125 per camper. The camp’s focus will be on learning the game in fun environment while participating in drills and games. The two-day Team Camp runs from Saturday–Sunday, June 23-24 is open to any high school teams of varsity, junior varsity or freshmen levels with a minimum of seven players per team. Meals and T-shirts will be provided to the campers and coaches, while teams are guaranteed a minimum of five games plus a single elimination playoff. There will be a chalk talk session for coaches with Weber and his staff on Friday followed by a coaches’ social. The cost is $120 per person for overnight campers and $100 for commuters. There are two ways to register for the 2018 Bruce Weber Summer Basketball Camps. You can sign up online at https://bruceweberbasketball.com/ or print off the camp brochure from the website and mail cash or check to Bruce Weber Summer Basketball Camps, 1800 College Avenue, Ice Family Basketball Center, Manhattan, KS 66502. All checks should be made payable to Bruce Weber Enterprises. For more information on the camp or to reserve a spot, please contact the men’s basketball office at (785) 532.6531 or email bbachamp@kstatesports.com.